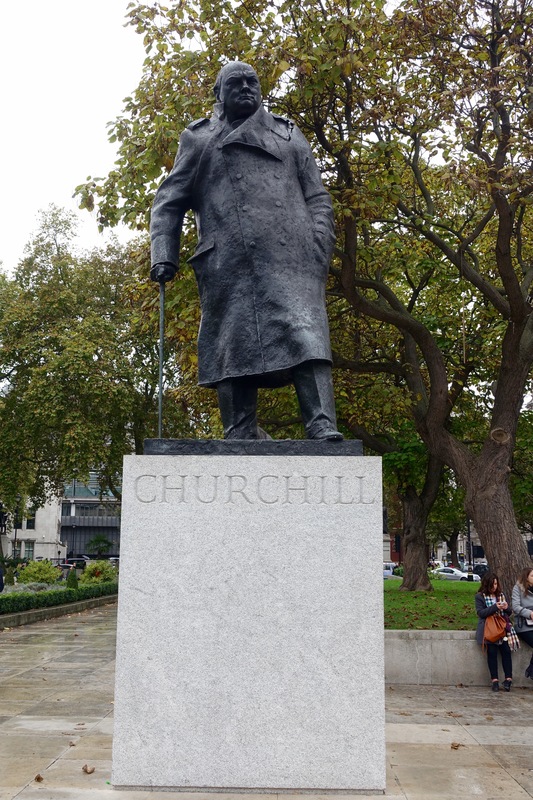 This statue of Churchill is near the Churchill Museum and Imperial War Rooms. “We shall never surrender,” Winston Churchill said, but for me, the time has come to surrender to modern museums. There was a time when you could go to a museum and study every exhibit, read every plaque, absorb most, if not all, of what the museum had to offer. Some museums were too big to assail, even in the old days of plaques and displays. Absorbing a fraction of what the British Museum has to offer is a life’s work. Same with the Louvre, the Smithsonian, the Ashmolean here in Oxford, or the National Museum of Anthropology in Mexico City, to name some that I have visited. 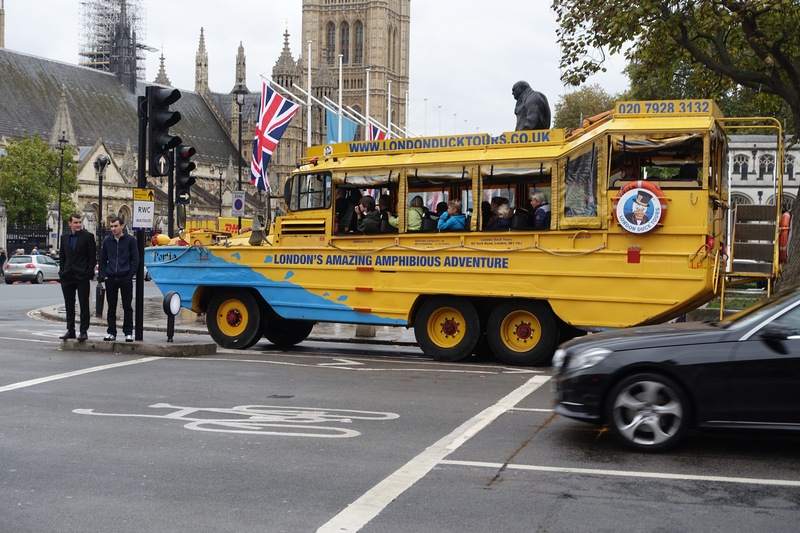 This mode of transportation passed me on the way to the museum. But in all of those places it used be that “had we but time enough,” we could run our eyes over everything on display, take in all the words posted before those exhibits. You might run out of life and time, but theoretically it was possible to take it all in. This first started to become clear to me at the Bletchley Park museum. Audio and film or video commentaries have been in museums for some time. Now add to that digital interactive displays that let you try your hand at cracking the Nazi Enigma code from World War II. It’s overwhelming and comes at you through all senses. It was the same in the Churchill Museum and Imperial War Rooms. With your 18 pound admission fee you are given an audio console you can wear around your neck. Arrive at numbered positions and you can key in that number to hear a narrative of what took place at that spot. The rooms have been left as they were in 1945 when World War II ended. So you can see and feel what life was like in these narrow corridors and cramped rooms. Add to that the sound of bombs going off as they were during the Blitz of 1940 and the shrill noise of V-1 and V-2 rockets in 1945 and you get a sense of the discomfort and trepidation that occupants must have felt. Walk into other rooms and there are videos of film taken during the war, others of war-room workers relating their experiences, kiosks where you can play Churchill’s speeches or select his witticisms (“A modest man, who has much to be modest about”) by the year uttered, photographs from Churchill’s life and from the war fronts. The epitome of museum overload comes at what I would call a “light table” that starts with Churchill’s birth in 1874 and goes through his death in 1965. Place your hand on one of the years displayed on this yards-long table and text is displayed about what happened to Churchill and in the world during that year. In some of the years, you can go month-to-month. As you walk along reading all this, you notice out of the corner of your eye other screens with videos going, hear other narratives, see posters from the war years, are tempted to go here, go there. This is not meant as a complaint about the Churchill Museum or other modern museums. It’s just a declaration of surrender to them. I know I’ll never be able to “conquer” all that these places have to offer, now displayed to all senses in all parts of the museum, all running simultaneously. Affirmation that there is so much to know and so little time to know it. As a former Duck captain, I can’t help but take pictures of them when I see them in other cities — despite the tragic accident in Seattle. Posted on October 27, 2015 by jbsaulPosted in TravelTagged Churchill Museum, London.